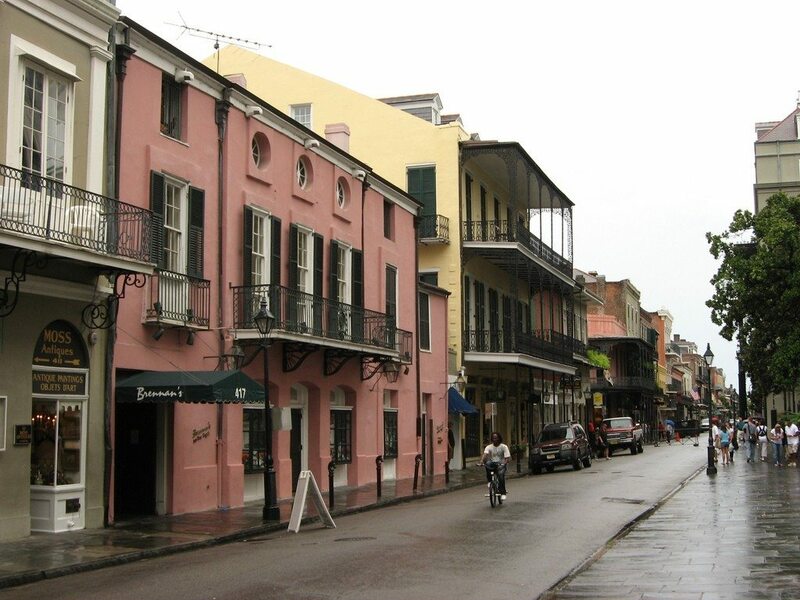 For a full 13 blocks, Royal Street runs parallel to Bourbon Street, yet this thoroughfare – one of the finest stretches of art galleries, antique stores, wrought iron balconies, restaurants and architecture in the USA – is sometimes almost completely missed by visitors. This is a real shame; beyond the qualities we’ve just described, Royal Street makes a nice counterbalance to the neon and noise of Bourbon. Well, you’ve read these words, so now you’ve been briefed: Royal Street is pretty cool. Here’s our block by block guide, running from Canal Street to Esplanade Avenue. The Monteleone is one of grandest of old school New Orleans hotels and has a history of housing authors – from Ernest Hemingway to William Faulkner to the annual Tennessee Williams Literary Festival – and ghosts. We are not big on contacting other realms of existence here, but we have come close in the excellent Carousel Bar, where the constantly rotating main bar area conspires with the strong drinks to make you feel extra loopy. Almost everyone coming to New Orleans has heard of Cafe du Monde, but Cafe Beignet seems to fly under a lot of radars. Without making a value judgment, we’d say the beignets at du Monde are smaller and crisper; the ones at Cafe Beignet are larger and softer. One definitive judgment call: this is one of the most romantic outdoor dining destinations in the Quarter. You’re on a quiet, pretty stretch of Royal where the main company is begging pigeons and sparrows. The 400 block of Royal is distinctive because an entire side of the street is taken up by one building: the Louisiana Supreme Court. This massive, marble Beaux Arts building wouldn’t feel out of place in Washington DC, but for the palm trees and humid wind that always sways around the steps. The structure was finished in 1910, vacated in 1958, neglected for decades, and eventually restored to its old glory in the 1990s. On the front steps, you’ll see a statue of Edward Douglass White Jr., 9th Chief Justice of the US Supreme County, best known for upholding the right of states to segregate in Plessy Vs Ferguson and upholding the 8-hour workday after reviewing the Adamson Act. Across the street is Brennan’s (417 Royal Street), one of the most important restaurants in the city. Back in the day, spots like Brennan’s led the revival of Creole cuisine that popularized New Orleans food across the country. Stop in for any meal, although we particularly love breakfast with an ‘eye opener’ (cocktail). The blocks of Royal between St Louis and St Ann streets become a pedestrian mall from 11am-4pm. Take advantage of that window and use your feet to explore this gorgeous window onto the French Quarter experience. Ladies looking to look good: it’s hard to beat this shop (even if by name alone), which sells 40s and 50s inspired retro dresses, jewelry, lingerie and all out fabulousness. There’s an entire line of clothes for those who live rockabilly, plus some corsets and other fun finds if you’re feeling adventurous. Get a little dressed up and treat yourself to a classical Creole brunch, accompanied by jazz music, in the airy, lovely courtyard this restaurant is named for. Or take a date here in the evening; there are few restaurants in this city that can match the sheer romantic power of the Court. While buskers can be found plying their trade all around the Royal Street pedestrian corridor, for some reason – maybe it’s the acoustics of the area – the quality of the live musicians who occupy this patch is generally quite high. Stop by, and try to soak up the shade and the sounds. While we would generally characterize Royal Street as the quiet alternative to Bourbon Street, this particular intersection, which sits at the back of the St Louis Cathedral and Jackson Square, is one of the busiest street scenes in the city. Artists hawk their paintings, street performers and puppeteers busk for the public, tourists mill about, and a general air of playful chaos extends onto the whole scene. This is one of our favorite intersections in the city. You should probably stop into every art gallery you encounter on Royal Street, but we have to cop to being particular fans of the works of Ally Burguieres, who is most well known for her sketches and paintings of animals. Her work is characterized by bold color, flowing lines and a general funky sensibility that’s easy to love. What do you need – love potions? A psychic reading? A little gris-gris to make the day go by easier? A fetish doll for the nightstand? Goats Milk voodoo soap? Erzulie reigns forth from this bright pink store, and she’s got you covered. She’s even helped develop a Voodoo app for your Android phone – hey, it’s the 21st century. While New Orleans revels in its historical aesthetic and architecture, the folks at Tresor showcase some of the most fascinating contemporary art in the city. On one visit, you may find handcrafted faux voodoo dolls, or giclee depictions of Catholic iconic art, or a tilework Arnold Schwarzenegger. The only limit is your imagination. Did you go and skip our suggestions about having a nice date night at the Court of Two sisters? That’s fine – the elegant courtyard and delicious modern Louisiana fare at Cafe Amelie are all part of a package that is equally as romantic and heart stopping. New Orleanians like to get dressed up – we’re not ones to say no to a costume party. And seeing as no costume is complete without a fabulous hair piece or wig, we feel confident saying Fifi Mahony’s is vital to the very cultural heartbeat of the city. Seriously: the staff here know how to put together some amazing head ornamentation or help you select the perfect wig for your dome. Don’t leave town without popping inside. One of the best preserved historic homes in the city, the Gallier House was built over 150 years ago and reflected the then-cutting edge of interior design. The house is operated as a museum alongside the Hermann-Grima House; visitors can marvel at period furniture and architectural details, and learn about both the Gallier family and the slaves, and later domestic servants, who enabled their opulent lifestyle. If it’s late at night and you need a po’boy in New Orleans, head on down to Verti Marte, which somehow packs the crowds in a store that feels like it has a total of 10 square feet of floor space. There’s plenty to love on the menu of this 24-hour bastion of calories, but you can’t go wrong with the All That Jazz – ham, turkey, shrimp, mushrooms and melted cheese doused in a sinful sauce that we dream about in the wee hours. Not many visitors list ‘West African cuisine’ as their number one reason for visiting New Orleans, even if much of the Creole food they enjoy has its roots in that part of the world (gumbo, for example, has clear links to West African stews). In any case, you can sample dishes like sauced piquant chicken served over joloff rice and wonderfully spiced greens, all served in a friendly, cozy dining room. One of the first places in New Orleans to feature vegan items on its menu. First: we know, it’s weird, this spot seems to share an address with Bennachin (above), but they’re just adjacent to each other. Mona Lisa is what a lot of people imagine when they hear “Italian restaurant” – it’s not fancy, but there’s dim lighting coming from candles plunked in chianti bottles, pictures of the old country, and some of the best pasta in the city. Bonus: it’s all cheap, including the delicious red wine.